I'd like to estimate the power density from a 13.56 MHz power source in a near-field WPT (wireless power transfer) scenario. Using a spectrum analyzer with a receiving antenna will give the E-field measurements, while for near-field WPT the magnetic coupled resonance is the used method (non-radiation). So, I suppose I cannot use spectrum analyzers to measure what I want. I'm wondering if there is any measurement method to measure the power (in dBm) emitted from a source to be harvested by a loop antenna in near-field concept. Any advice would be highly appreciated. WPT (wireless power transfer) is typically performed using flat, multi-turn coils (inductors) as antennas. In some cases, the coils are self resonant based on their parasitic capacitance and self inductance in order to avoid the losses in a typical matching network. 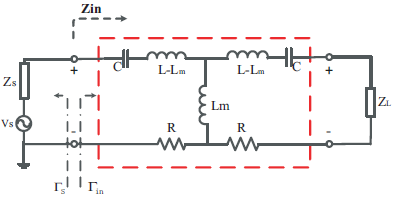 Due to the close proximity of the two coils, the mutual inductance must also be considered. The amount of power that can be transferred is heavily influenced by ensuring that the input impedance of the transmitting coil is a conjugate match for the ZO of the transmitter and that the load impedance, ZL is a conjugate match for the overall system. Because the mutual impedance factors into this condition, it is typical that the system is first modeled in order to reduce the unknowns prior to commencing construction. Because the system is closely coupled, the load impedance of the receive antenna should also be included in the modeling exercise. Unlike a radio link with identical antennas in their far fields, the mutual inductance factor often causes the optimum load impedance of the receive antenna to be different than the transmitting coil input impedance even though the coiled antennas are identical. If you are interested in a fairly easy read, and the basic math, regarding WPT you may enjoy the practical academic paper by Minfan Fu, Tong Zhang, Xinen Zhu and Chengbin Ma entitled A 13.56 MHz Wireless Power Transfer System Without Impedance Matching Networks, to which the above diagram is credited. Not the answer you're looking for? Browse other questions tagged antenna-theory rf-power measurement spectrum or ask your own question.